Egg Harbor Township, New Jersey (May 27, 2015) — Individuals with a flair for cooking can now put their passion to work at Star Career Academy’s Egg Harbor Township campus, which recently introduced three new culinary programs: Professional Cooking, Commercial Cooking, and Professional Pastry & Baking. 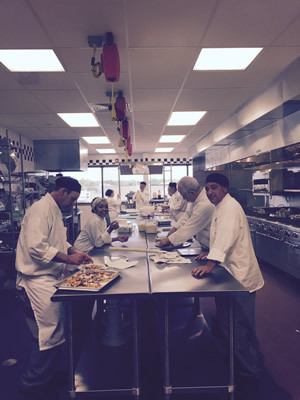 The Professional Cooking class began on April 7, 2015, with new classes beginning each month. Starting on June 22, 2015 the campus will begin its first Commercial Cooking class and on July 1, 2015, the first Professional Pastry & Baking class. To celebrate the inception of these new programs, Star Career Academy will be hosting a Culinary Grand Opening on June 4, 2015 from 2 pm to 6 pm. Individuals interested in learning more about the new programs will have the chance to do so at the celebration. Star Career Academy is kicking off its Grand Opening with a Ribbon Cutting Ceremony from 2:00pm – 2:30pm. Immediately following the Ribbon Cutting Ceremony until 6pm, the campus will give individuals a chance to tour the campus and see the culinary division, which houses three fully equipped, commercially designed kitchens. Cooking is a growing field in which many individuals are seeking employment. The Bureau of Labor Statistics predicts a 5% job growth over the next 10 years for head chefs and a 10% job growth over the next 10 years for cooks. Star Career Academy has a history of producing satisfied graduates. Star Career Academy Graduate Aronita Foxwell initially began attending classes simply to hone her cooking skills, but after spending time in the classroom, she realized that she wanted to make cooking her career. Foxwell realized her dream and works in her field as a chef. Now, individuals residing near the Egg Harbor Township campus have the same opportunity to pursue this career path. Members of the community who choose to attend the Culinary Grand Opening at the Egg Harbor Township campus can enjoy student prepared hors d’oeuvres while watching student cooking demonstrations and learning about exciting opportunities available in the culinary field. Star Career Academy offers hands-on training and puts culinary students in a real-world environment with its modern commercial grade facilities and its externships. The culinary programs emphasize “learning by doing” with special attention given to the practical side of professional food preparation. Students learn the skills to gain employment in a variety of work environments, such as restaurants, bakeries, health-related institutions, catering, and food trucks. Graduates are prepared to work in entry-level food service roles, including sous chef, Garde Manger, baker, pantry person, short-order cook, and line cook. The three culinary programs are headed by Program Chair/Head Chef Woodrow Smith, who has worked as a chef at The Mirage in Las Vegas, NV. Prior to coming to Star Career Academy, Smith worked as the Head Chef at Curtain’s Wharf for the last 17 years. With a desire to give back and step back from the fast-paced environment of the kitchen, Smith decided to continue his career journey at Star Career Academy. Chef Instructor Brian Fowler has a history of teaching culinary arts at the collegiate level, most recently as the Chef Instructor at Burlington Community College. Members of the community who are interested in learning more about cooking but who do not wish to earn a diploma or degree can attend Star Career Academy’s one-day recreational cooking classes, which is open to the public and will begin this summer. Star Career Academy is focused on teaching its students the skills they need to excel in a variety of environments, including the fast growing field of culinary arts. Star Career Academy’s Egg Harbor Township campus also offers medical assistant and dialysis technician programs, offering students several options of study in growing, sustainable career fields. The campus is conveniently located near main line bus stops serving South Jersey cities and several major highways. In the last two years, Star Career Academy has put over 2,500 graduates to work in a related field after they received training. Star Career Academy is all about providing students with the opportunity for accelerated access to employment in the career field of their choice. Star Career Academy in Egg Harbor Township is located at 3003 English Creek Avenue (English Creek Shopping Center) and provides a close-to-home and valuable training and education resource for those looking to help them with the skills to be employed. Call 609-407-2999 for more information. Star Career Academy is accredited by the Accrediting Commission of Career Schools and Colleges (ACCSC). For more information about our graduation rates, the median debt of students who completed the program, and other important information please visit our website at www.starcareer.edu/faq.